Ah, the grocery store. We all have to go there at some point. Too many mystery spills and not enough cashiers, ever-present whining children and never-present samples of ice cream. It can be a chore, a pain. I typically wait to do my grocery shopping until after midnight on a Tuesday night. Nothing magical happens then, it’s just when the kids are in bed and the stocker’s stereos are turned up nice and loud. It’s like clubbing for moms who showed up in minivans with their reusable grocery bags. Stayin’ out late, bumpin’ those jams, breakin’ a sweat and the overwhelming feeling of regret at the end – usually once I see the total. Yeah, totally like clubbing. 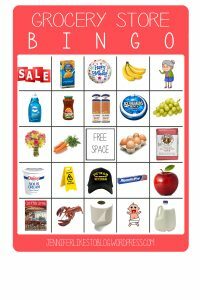 As evidenced by my very first blog post, I put a lot of thought into grocery shopping. 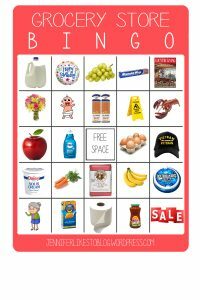 Here is my contribution to your next trip: Grocery store BINGO. Print it. Do it. Reward yourself. If you get a BINGO (5 across, postage stamp, or blackout, your choice), buy some canned goods to donate. You’ll feel extra great about your trip! 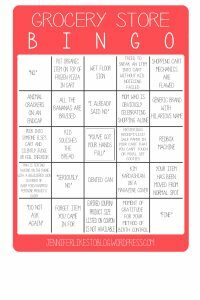 This BINGO sheet is specific to moms, but feel free to adjust as it meets your needs. Okay, okay. And since I actually want to be helpful, here’s something for the kids – Kiddo Bingo. There are 3 different sheets, so they can play against each other. If you have more than 3 kids, I’m sincerely sorry. Maybe have one help with the list, or form teams! 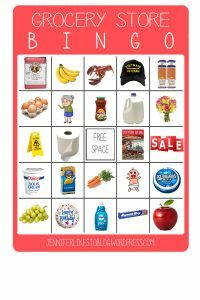 The images are in no way representative of my grocery list and I’m definitely not endorsing brands or suggesting you buy what’s shown, they’re just things that the littles are likely to see. And if they find a veteran’s hat, encourage them to thank the vet for their service, shake hands, and smile! The winner gets to help put items on the belt at the cash register, pick something special to donate to the local food bank, or pick what you’ll make for dinner that night!